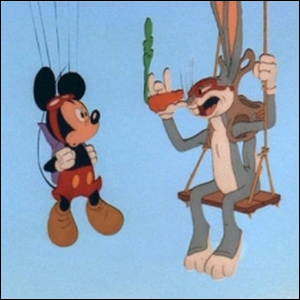 The Only Film Where Mickey Mouse and Bugs Bunny Appear Onscreen Together Is? In the 1988 live-action/animated comedy hybrid movie Who Framed Roger Rabbit, a neo-noir detective film about a disturbance in the toon world that affects both real actors and cartoon characters alike, there’s a host of famous cartoon cameos. The film included cameos by classic Walt Disney characters and classic Warner Brothers characters, including the most famous character from each animation studio, Mickey Mouse and Bugs Bunny, respectively. In fact, it was the first time the two animated characters appeared together in a film. Further, extra sharp movie goers may have noticed that the two characters only appeared together and for exactly the same length of time. That was a stipulation between the two animation houses: each major character (Mickey and Bugs, Daffy and Donald) would receive equal screen time with their counterpart. In the case of both pairs of characters, it was easier to just slap them together in the same scenes to ensure that they had equal screen time.